This is somewhat of a ‘runseeing’ tour of Boise, highlighting a section of the greenbelt, several parks, and some of Boise’s important sights near downtown. We start the route in the heart of Boise State University, next to large Albertsons Stadium. Take a quick jaunt around the pleasant campus, including the impressive library and typical quad, then head toward the river and across the Friendship pedestrian bridge to the north side. 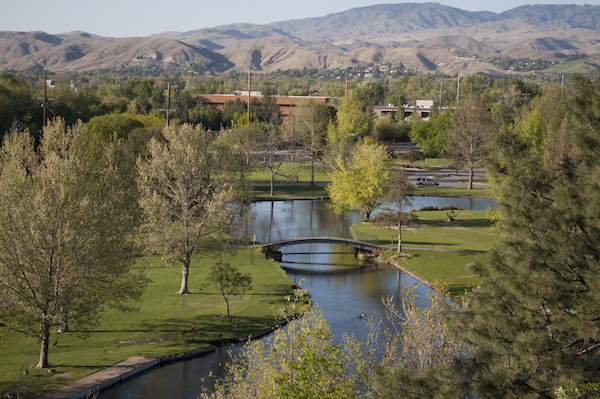 You are then in Julia Davis Park, one of ten parks called the ‘Ribbon of Jewels’, each named after women civic leaders of Boise. Run north on the paths through the park, then along Julia Davis Dr., around the Discovery Center (Science Museum), Idaho Black History Museum, Boise Art Museum, and then cross S. Capitol Blvd. to the Idaho Anne Frank Human Rights Memorial. Head west along the Greenbelt, for about 1 mile, and cross back over the river at the bridge across from the Payette Brewing Company. You’ll then do a tour of lovely Ann Morrison and Kathryn Albertson Park, and then the final 1.5 miles along the southern side of the greenbelt path. There are numerous options to modify this run, or join in at any point. Add-On: Quick jaunt up to the Capitol. At the Art Museum, head north on S. Capitol (view of capitol) or S. 6th St. (more pleasant running street) for 0.5 miles to the Capitol. Can also add along the greenbelt path.